In scenes alternately breathtaking and serene, 19th-century artists illuminated their experiences of the American landscape. American Vistas: Landscapes from the Collection takes a fresh look at the Museum’s collection in conjunction with our presentation of The Poetry of Nature: Hudson River School Landscapes from the New-York Historical Society. The selection of works includes the perspectives of American artists painting, printing, and drawing both familiar and far-flung locales, as well as European artists exploring and recording the New World. Many of these artists subscribed to the Hudson River School’s tenet of truth, carefully working from nature, while others took interpretive liberties with romantic visions. From the roaring tumult of a waterfall to the quiet reflection of autumn color on a lake, the strength of these landscapes is in offering the feeling of being there, in a particular place, season, and time of day. Featuring works by artists such as Albert Bierstadt, Karl Bodmer, Gustav Grunewald, and Thomas Moran, this exhibition presents sublime, dramatic, and contemplative scenery from Niagara Falls, New York, to Bethlehem, Pennsylvania. In scenes alternately breathtaking and serene, 19th-century artists illuminated their experiences of the American landscape. This exhibition took a fresh look at the Museum’s collection in conjunction with our presentation of The Poetry of Nature: Hudson River School Landscapes from the New-York Historical Society. The selection of works included the perspectives of American artists painting, printing, and drawing both familiar and far-flung locales, as well as European artists exploring and recording the New World. 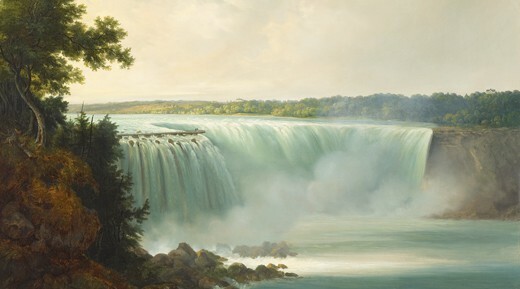 Featuring works by artists such as Albert Bierstadt, Karl Bodmer, Gustav Grunewald, and Thomas Moran, this exhibition presented sublime, dramatic, and contemplative scenery from Niagara Falls, New York, to Bethlehem, Pennsylvania. The exhibition program at the Museum is supported through the generosity of the Harry C. Trexler Trust, Julius and Katheryn Hommer Foundation, The Century Fund, Bernard and Audrey Berman Foundation, Leon C. and June W. Holt Endowment, Martin Guitar Charitable Foundation, Pennsylvania Council on the Arts, National Endowment for the Arts, and Friends of the Museum.